Wessex Tubas are this next two weeks at our factory in China, quality assuring and developing new instruments. Here is a sight to please tuba players - 4 of our new 6/4 CC tuba being checked before finishing. The one being played by Chuck Nickles is a special version of the tuba, with 18" bell, the "Chicago-Presence", which we actually prefer to the regular 20" bell "Chicago-York". It gives the tuba a more focused tone and an immediate response more like you would expect of a 5/4, while still having the power of a 6/4. There are lots of other exciting developments, so look out for further posts. I will try to post daily during our visit. Will you have both examples at the Army Tuba Euphonium workshop in 2018? Here is first view of Wessex new 4/4 BBb tuba, the "Dragon" - which will be available in both 4-valve and 5-valve versions. This is a completely new Wessex design and not a clone of anything. Bell is 19" and bore starts at 0.75". Both versions will be exhibited at US Army workshop and TMEA next February - and be available from March 2018. This model replaces our previous TB580 Michigan model being of similar size. Is that going to be a tuning-in-slide contra in F? LowBrassNYC wrote: Is that going to be a tuning-in-slide contra in F? It will be nice to see an affordable contra on the market that isn't a clone. I love the flexibility of the valve tuning, brilliant! Looks great! Any chance of doing a cut-bell? LowBrassNYC wrote: Looks great! Any chance of doing a cut-bell? Are you talking about a removable bell?
. It took me 5 minutes looking at the fake hagmann valves on my contra to realize there has to be a better way. Even Edwards offers a traditional rotor trombone now, it seems the "tried and true" rotors are coming back into style. . I'm so glad that John packer didn't go with Thayer valves on its excellent rath designed bass. A local person brought me a Jinbao-made double fake H-valve bass trombone, because it would not play for them. I removed the valves and showed those valves to them. Even though they were saddened when they looked at those valves, they had to laugh. They then asked me if I was interested in buying that instrument from them for a very low price. I expressed sympathy, but also pointed out to them that it was of no more use to me than it would be to them. The proportions of "the dragon" are very nice. It will be interesting to hear how it sounds & plays. hrender wrote: The proportions of "the dragon" are very nice. It will be interesting to hear how it sounds & plays. We need a piston f! Yes, like what's common on horns and is trending with tenor and bass trombones. Could make for a lower profile case and easier to transport. MikeMason wrote: We need a piston f! Not just one, but two very different piston F are in development. Both we hope to have prototypes to exhibit at US Army workshop. What are you expecting a possible price for the standard rotor F contrabass trombone? 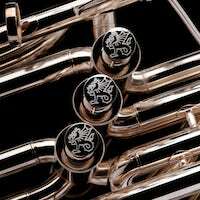 KiltieTuba wrote: What are you expecting a possible price for the standard rotor F contrabass trombone?